Tim Rogers, CA problem: "I have run into an issue where two levels are constrained to one another. 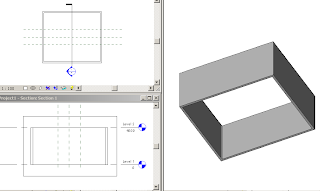 I have searched all through my model and cannot find dimensions or anything else that would constrain the two levels to one another. Is there something else that would cause this?" Kevin Shumbera, HOU solution: "If a dimension is locked and then deleted, Revit gives you an option of leaving the constraint or removing it with the dimension. 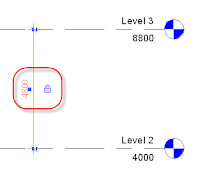 Unfortunately, if the dimension is deleted but the constraint is not removed, there will be little visible evidence of the level being locked. 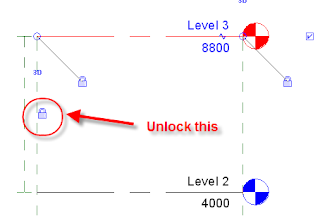 If this has happened, when you select the level you will see a locked symbol on the far left or right (in addition to the locked symbol referring to the ends of the level moving together)." I checked this out and sure enough you right and applies to other objects like walls etc, thanks for the solution! Important: Don't over constrain your model, if you not sure leave it unlocked!! 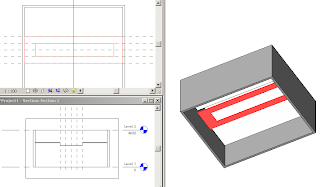 Alvaro, HOU asks "Can someone help me snap drafting lines to corner wall situations - when drawing roof drain lines?" 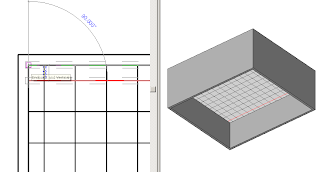 Here are some simple steps to creating Ceiling in Revit, leading to a feature ceiling and a dropped bulkhead ceiling (click on images to see full size). 1. Open a Ceiling Plan view. If you add ceiling in the floor plan view you will get this warning. (If the walls are not showing correctly it is likely that your view range is not set correctly also check VG for worksets and model objects. 2. 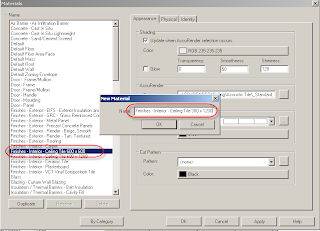 Click Modelling menu Ceiling, or on the Modelling tab of the Design Bar, click Ceiling. 3. 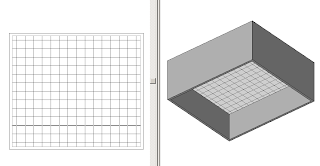 In the Type Selector, select a Compound Ceiling 600 x 600. 4. Click inside a room to place the ceiling. A ceiling appears. 5. 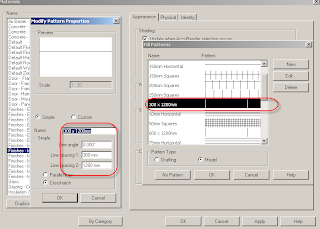 Adjust the grid by using Move to set out to centre of room or corner etc. 6. You can sketch a ceiling to be any shape you need. In this example the room has a 600x600 grid and a plasterboard ceiling being defined. 7. For a ceiling that has a plaster border, you can create a ceiling in sketch mode, add an inner ring to create the whole. 8. Fill the hole with a nother ceiling in this example 600x600 grid by using the ceiling sketch mode and ajusting grid position (5) to center the tiles. 10. 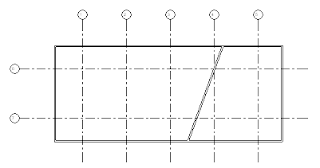 In this example the ceiling is 5omm thickness. I need to create walls to form the upstands - to do this duplicate an existing wall, edit and change width to 50mm, and select Finishes - Interior - Plasterboard for the material. 11. Add 50mm plasterboard walls to the inner ceiling surround. 13. Adjust in sketch mode the celing extent to align with the wall faces. 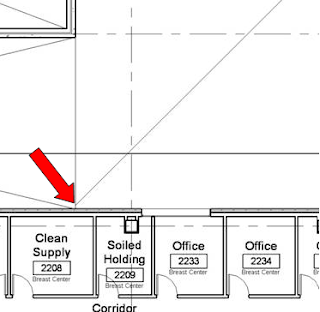 Note that doing this correctly will mean that the lower ceiling goes below the upstand wall and therefore is not visible in the Ceiling plan. In the following example a ceilng bulkhead is created with a 300x1200 ceiling plank. 1. Create some reference lines to construct ceiling. 2. Add plasterboard ceilings to either side of the bulkhead using sketch mode set to 2600. 3. Add another ceiling for the bulkhead surround. Set this ceiling at 2300. 4. 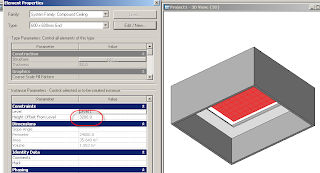 Add a new Compound Ceiling family by duplicating the 600x600 grid and name as 300x1200 Grid. 6. Sketch the shape of the new infill ceiling. 7. If the grid is round wrong way, click on ceiling and rotate 90 deg. 8. Finished ceiling with bulhead showing 300x1200 planks. 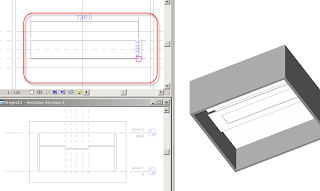 12 Feb - Chirag says: "To create upstands or soffit walls, change the wall function to soffit. In this case, the attachment is made to the surface of the ceiling, regardless of the shape of the ceiling. Use join geometry to clean it up"
How do I create a matchline to references small views of a building that is too large to fit on one sheet? 1. 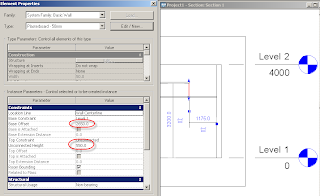 Select a floor plan view that will become your “primary view”, right click and create a new view by using the command Duplicate View/Duplicate as a Dependent. 3. 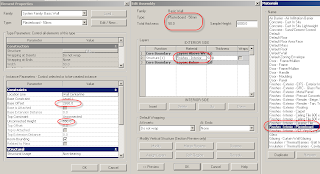 In the dependent view turn crop region on, and adjust it to suit the sheet size. 4. Now you are ready to create the next dependency, it is easier to duplicate from the dependent you have just created as you can move the crop box. 5. 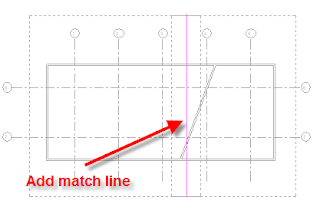 To create match lines go to the Primary View and turn on crop regions. 6. In design bar, View/Matchline – and draw match lines between the overlapping sheets. 7. Now you can add a symbol to show the drawing number – using View/View Reference. 8. Place the views onto sheets for the View Reference symbols to be populated. For more information look at the Revit help file under View References or Matchlines. This approach can also be used for sections and elevations. 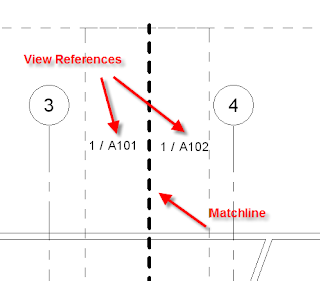 However, the solution falls short of being able to get the Matchline references onto a sheet, as Revit does not permit independent scales on the Primary View (which the dependencies are related too). 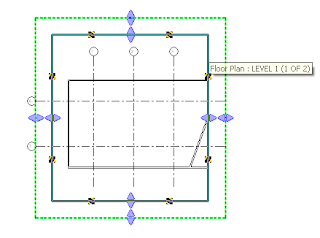 For example I have a project that has 1:200 floor plans to describe the full floor plan and eight 1:50 views, the only way I can label the 1:200 is to create a duplicate view (not independent!) and add text which is disappointing. If you have suggestions for a better way please add comments to this post. I was using this method for the project I am working on right now. 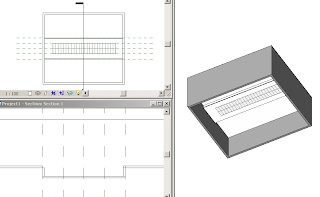 However, the project manager did not like the fact that the matchline was in the same place on each dependant view; so, anything that was covered by the matchline in one view was also covered by the matchline in the adjacent view.My solution was to use a custom View Reference based on the standard "Matchline HOK.rfa" file I found in our HOK Content folder. 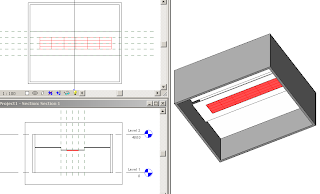 By using a view reference made to look like a matchline each dependant view could have its own "matchline" in a slightly different location. Having the matchlines in different views offset from each other (with a little portion of the building shown in both views) prevented any portion of the building from being obscured by the matchline in both dependant views.